Dichopogon fimbriatus, the Nodding Chocolate Lily, is a member of the Antheriaceae family. 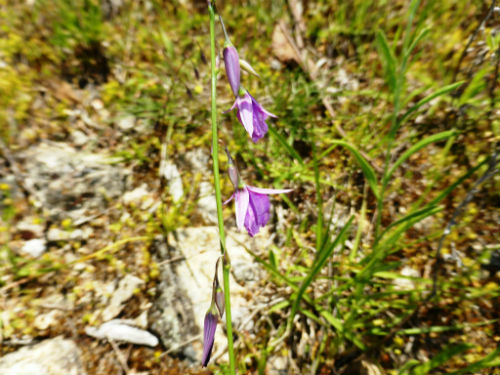 Previously the species was included in the Liliaceae family and was known as Arthropodium fimbriatum. The Nodding Chocolate Lily is an erect herb reaching a height of one metre with fibrous roots terminating in a tuber. The linear leaves are up to 35 centimetres long and grass-like in appearance. In spring and summer each plant carries a flower spike carrying about 12 large, blue, six-petalled flowers. The flowers have a strong chocolate scent. The scent becomes very strong when a number of plants are growing close together. D. fimbriatus, as yet, is not cultivated in our cold climate garden but is common in the regenerating grassland surrounding the garden. The spring of 2016 was a bumper year for Nodding Chocolate Lilies and other native herbaceous species. Triggered by good rain in the preceding autumn and winter Nodding Chocolate Lilies flowered in large numbers. At times the chocolate scent was almost overpowering. D. fimbriatus is a widespread species and occurs in Queensland, Victoria, South Australia and Western Australia as well as NSW. The Nodding Chocolate Lily has a future as an aromatic addition to native cottage gardens, rockeries and containers particularly when planted en masse.